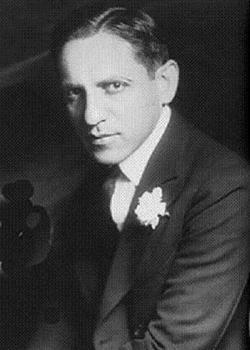 Not a vaudeville star himself per se, German-born Gus Edwards was more the Godfather of a hundred stars. He was vaudeville’s premier producer of kiddie acts. Having started out himself at Tony Pastor’s in the Newsboy Quartet, he went on to build a producing machine that developed and presented scores, probably hundreds of pint-sized vaudevillians — many of whom went on to bigger and better things. Famous products of the Gus Edwards mill include: Groucho Marx, Georgie Jessel, Eddie Cantor, Phil Silvers, Walter Winchell, Ray Bolger, Eleanor Powell, Sally Rand, Bert Wheeler, Lillian Roth and the Duncan Sisters. To find out more about the history of vaudeville, including Gus Edwards, consult No Applause, Just Throw Money: The Book That Made Vaudeville Famous, available at Amazon, Barnes and Noble, and wherever nutty books are sold.